My eyes are getting used to wearing glasses, I'm not as tired in the evenings now so that's a good thing; and I finished up a project I've had in the works - finally. 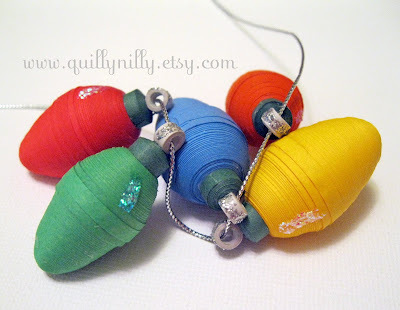 NEW to Quilly Nilly and my etsy shop, 3D miniature paper quilled Christmas bulbs. I think they turned out pretty cute and I can't wait to hang them up somewhere; I was thinking they'd be neat to hang in a window or the top of my computer monitor and of course my coworker wants 3 sets to hang on her mini Christmas tree. I'm sorry, it's been way too long since I've had anything to share. Actually I've been working on some new things but it's been slow going. I've been dealing with sinus issues, we think; and today I finally went to the eye doctor and will be picking up my first pair of glasses. 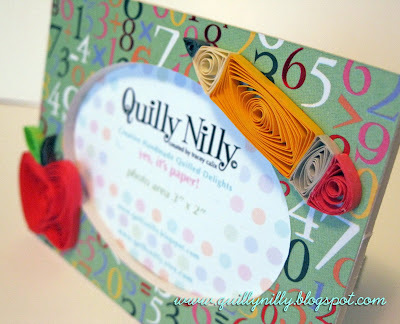 I'm hoping to be back to my quirky creative self soon and will definitely get on here with new item photo's and updates. 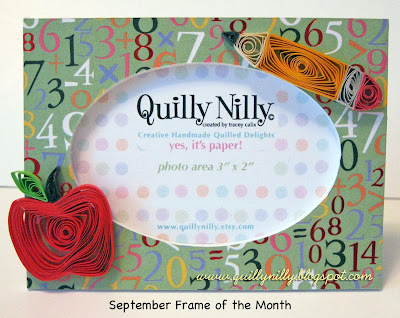 For now, here is the September mini frame; even in my sinus induced haze I think it turned out pretty cute.